The first live televised debate of the Fiscal Compact campaign will see two leading politicians from each of the Yes and No camps. 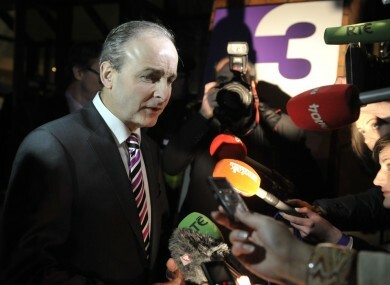 FF's Micheál Martin is the only leader of the four main political parties to appear in tomorrow's debate. TV3 HAS CONFIRMED the line-up for its live televised debate on the Fiscal Compact tomorrow night, the first of the referendum campaign. The debate, hosted by Vincent Browne, will only feature one party leader – Fianna Fáil’s Micheál Martin – with the Taoiseach, Tánaiste and Sinn Féin leader Gerry Adams all declining to participate. The hour-long debate, airing tomorrow night at 9pm, will see Martin argue for a Yes vote alongside Fine Gael’s director of elections for the campaign, agriculture minister Simon Coveney. Arguing the case against ratification of the treaty will be Sinn Féin deputy president Mary Lou McDonald and the Socialist Party’s Joe Higgins. TV3′s Director of News, Andrew Hanlon, confirmed that the leaders of Fine Gael, Labour and Sinn Féin had all declined to participate in the debate for various reasons. “We are happy to host the first national television debate on this highly important and divisive issue which we hope will help our viewers make an informed decision on May 31st,” he said. The debate will be followed at 11pm by the usual edition of Tonight with Vincent Browne, offering analysis and discussion of the debate. It is understood that Gerry Adams had declined to participate in the debate because of allegations made against him on a previous TV3 programme, which the Louth TD believes went unchallenged. Enda Kenny had previously declined to participate in Browne’s debate in advance of last year’s general election, in an apparent dispute over on-air comments made by the TV3 host. However, Browne himself said earlier this month that he understood Kenny’s objection to appearing in tomorrow’s debate was a procedural one, and was not related to that previous dispute. Email “TV3 confirms line-up for Vincent Browne's referendum debate”. Feedback on “TV3 confirms line-up for Vincent Browne's referendum debate”.